Can the Queen’s Guard Really Not React to People While on Duty? 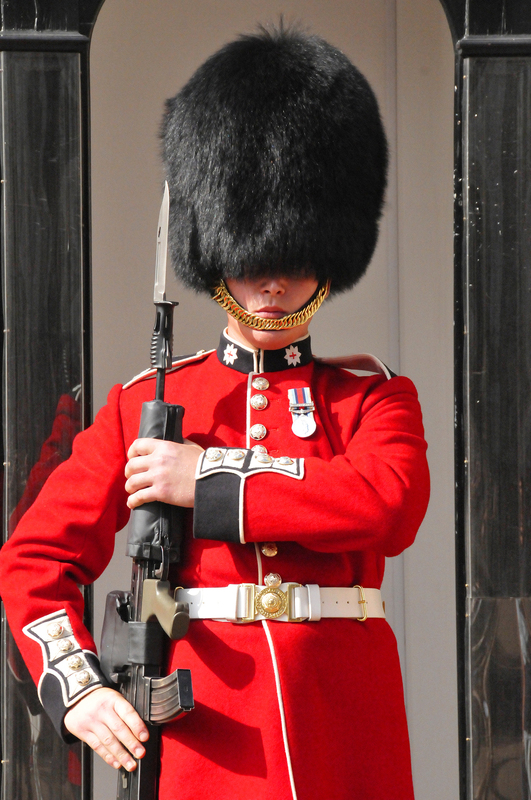 Gianna D. asks: On movies the guards outside of Buckingham palace can’t move while on duty, is this true? “The Queen’s Guard” comprise of various soldiers tasked with guarding the residences of the Queen and, by extension, the Queen herself. Consisting of soldiers (mostly) hand picked from five elite regiments within the British military, the Queen’s Guard are internationally renowned for their stoic dedication to duty. However, contrary to popular belief, these soldiers are permitted to move (and do so regularly, even when just on guard duty and not on parade) and in certain circumstances do react to hecklers or the like. But despite these bastions of British stoicism’s reputations, they do move regularly- at least every 10 minutes they will turn and patrol their post, which usually involves taking about 10-20 paces one way and then back before once again resuming their vigil. Occasionally a guard may also perform such a march to approach an individual within their vicinity who is being a particular nuisance or the like, but the more common purpose of these little jaunts is usually just to get the blood flowing again to keep it from pooling too much in their legs, potentially causing the soldier to faint. Speaking of fainting, if a soldier begins to feel themselves succumbing to such, they are taught to “faint to attention”. This basically means that they must faint while maintaining their standing at attention pose. In practice when achieved, this tends to result in them falling rigidly over like a toy soldier, which is why pictures of guardsman laying face down, rather than more or less crumpled, on the ground abound on the web. Fellow Queen’s Guard members around said individual are forbidden from deviating from their duty if this occurs and will in fact march straight over their fallen comrade if necessary. (Medical personal will, of course, be sent out to attend to the individual when this is observed.) While not a common occurrence, this does happen every now and then. For instance, during the 2017 Trooping the Colour, in which temperatures sat around 27°C (80°F), five of the Queen’s Guard, baking in their many layered, thick uniforms and bearskin hats, passed out. Beyond fainting and marching, the guards also may move about in a variety of other ways- they are guards after all. However, given that their roll has largely been reduced to a symbolic one, with local law enforcement generally taking care of any problems that arise around the Queen’s residences, today one of these elite soldiers breaking their normal stoic stance is generally simply due to tourists, rather than a real threat or need for them to perform as actual guards. Come to attention sharply, involving a very loud stamp, which is all the more startling when said soldier was otherwise motionless before. Shouting sharp instructions at the individual being a nuisance. This might be something like “Step back from the Queen’s Guard!” with the guards required to keep their warnings and ultimatums brief and to the point. Pointing the bayoneted rifle directly at the person being a nuisance. If all else fails, doing whatever is necessary to detain the person causing the disturbance or pressing a button in the sentry box to alert police to come deal with the situation. One potential almost surefire way of eliciting such a strong reaction is to touch the guard or otherwise exhibit extremely disrespectful behavior, such as marching along beside the soldier in a mocking fashion while insulting the guard verbally. And if you’re wondering whether said rifles that may be pointed at your face in such a scenario are loaded are not, they are usually not. (Though one imagines having a sharpened bayonet wielded by a highly trained soldier shoved in your face is intimidating enough, even if you know the gun it’s attached to is not loaded.) Occasionally the Guard do carry ammunition with them though, particularly when there’s knowledge of a credible threat to the safety of the Queen or nation or otherwise when a heightened state of security is ordered. In these cases, if necessary, the soldier can load the rifle in a blink by simply ejecting the empty magazine and popping in a full one. And, yes, as actual guards- even if their duties today are mostly ceremonial in practice- said individuals are authorised to use deadly force when appropriate, most notably if they feel their own lives, members of the royal family, or the general public near their guard post are endangered. It’s also noted that having banana peels or other such items placed along a soldier’s marching route is occasionally a thing. People also sometimes attempt to untie the guard’s shoelaces. One member of the Guard even noted it wasn’t uncommon for people to “stick pins in you” to try to make guardsmen flinch. It’s not all bad, though, and guardsmen have noted that some people are quite respectful when approaching for photographs and the like. Further, one guardsman noted in an interview there was a general “perk” of frequently having women flash guards to get a reaction and also sometimes having phone numbers and addresses slipped into their pockets by those women no doubt wanting to see whether the ability to stand at attention for hours at a time translates to the bedroom. Today, many problems the Queen’s Guard have long had with the general public has been mitigated somewhat. To get around the fact that the public seemingly can’t be trusted to act respectfully around said soldiers, the guards in many, but not all, cases now stand behind fences or roped off areas. They still have to deal with the heckling, of course, but at least can now in many posts avoid being stuck with pins. Who is Buried in the Tomb of the Unknown Soldier? What Powers Does the Queen Actually Have? Before a parade, the iconic bear skin hats of the Queen’s Guard are shampooed and conditioned to make them look as glossy and full as possible. Individual soldiers are also expected to comb their hats on a daily basis. These bearskin hats are made from Canadian brown bear and generally weigh around 1 kg, though get significantly heavier when it’s raining. The practice of the Guard wearing large bearskin hats dates back to the early 19th century, with the hats’ purpose primarily meant to intimidate by making the soldier wearing it look much taller. In some ways, the Queen’s Guard are comparable to the soldiers who guard the Tomb of the Unknowns in the US. Both are famed for their discipline and commitment to duty and both can, contrary to popular opinion, deviate from the strict, regimented routine should a member of the public act in a disrespectful manner. For more about these soldiers you can read our article about them here: Standing in a Hurricane- Watching Over the Tomb of the Unknowns. Although the soldiers who serve in the Queen’s Guard are invariably “a member from one of five regiments of the Foot Guard from the British Army’s Household Division”, specifically the Grenadier Guards, the Coldstream Guards, the Scots Guards, the Irish Guards and the Welsh Guards, (meaning the Queen is being protected by soldiers from the four countries that make up the United Kingdom) they can, in theory, hail from any regiment serving in the commonwealth. Because of this, the duties of the Queen’s Guard have, on occasion, been assumed by everyone from the Royal Marines to the Canadian Expeditionary Force over the years. It would be very difficult to put a cigarette-end “down the rifle butts”. Down the rifle’s barrel would be much more likely. “given that their roll has largely been reduced” – why, too many carbs in their diet? Ireland is not a part of the united Kingdom. i could tell this was a Karl Smallwood article just from the video. I found this article very interesting although the puncuation made it very fustrating to read.